Flight instructor Stanley Cleveck (left) with student pilot Matthew Graves. 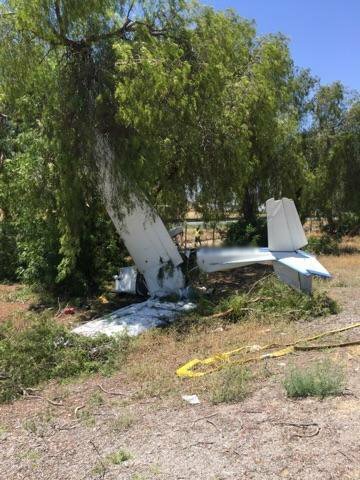 On June 2, 2017, about 1130 Pacific daylight time, a Cessna 150M, N66117, was substantially damaged when it impacted terrain shortly after takeoff from Banning Municipal Airport (BNG), Banning, California. The flight instructor was fatally injured, and the student pilot sustained serious injuries. The airplane was registered to and operated by Aerotech Academy Inc., under the provisions of Title 14 Code of Federal Regulations Part 91. Visual meteorological conditions prevailed, and no flight plan was filed for the instructional flight, which originated from Redlands Municipal Airport (REI), Redlands, California about 1045. 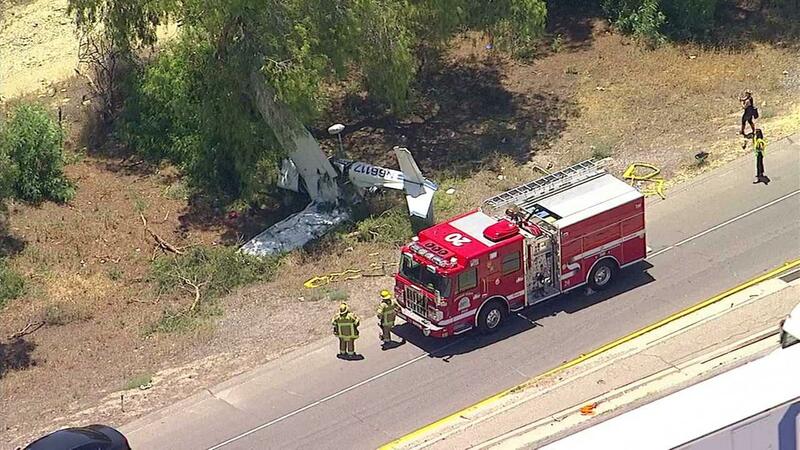 According to the student pilot who was working toward his private pilot certificate, he and the flight instructor were flying the accident airplane that day due to a scheduling issue with the Cessna 152 that he typically flew. A weather briefing was accomplished before the flight. After departure from REI, they climbed the airplane to 4,000 ft mean sea level (msl) where they conducted airwork; the wind was calm at altitude. The instructor then asked the student to return to BNG, to perform a touch-and-go landing. Upon arriving at BNG, they entered a right traffic pattern for runway 26 and proceeded to land. The student reported that they landed hard, and though the wind was gusting, they continued the takeoff. He reported that, after takeoff, and when the airplane drifted right of the runway centerline, he had the flight instructor take control of the airplane. The student's last memory of the event was the airplane impacting trees along the freeway that ran parallel to the runway. A witness at BNG observed the accident airplane on a low approach to runway 26 where it performed a touch-and-go landing. The airplane departed the runway, and about 100 ft above ground level (agl), it began to lose altitude. 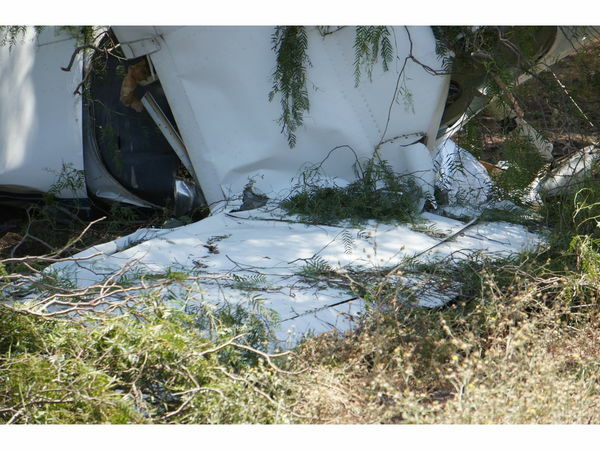 As he continued to watch the airplane, the wings wobbled, and shortly thereafter, the airplane impacted trees near railroad tracks on the northwest side of the airport. The witness stated that the wind was from the east, but he could not remember the wind speed. Another witness located at the flight office at BNG noticed the airplane on low approach to runway 26. The witness continued to watch the airplane complete a touch-and-go landing and climb to about 100 ft agl. The airplane then began to descend in a nose-high attitude. The airplane settled about 40 ft agl and did not gain any altitude. As it crossed over the departure end of runway 26, it made a slight turn to the northwest as the wings began to wobble. The airplane pitched up to avoid a train, then impacted trees in a 90° right bank. The witness stated that the train prevented him from hearing whether the engine was developing full power. The witness also stated that there was, "more than enough runway and overrun to abort but [the airplane] seemed to keep trying to climb until it finally crashed." 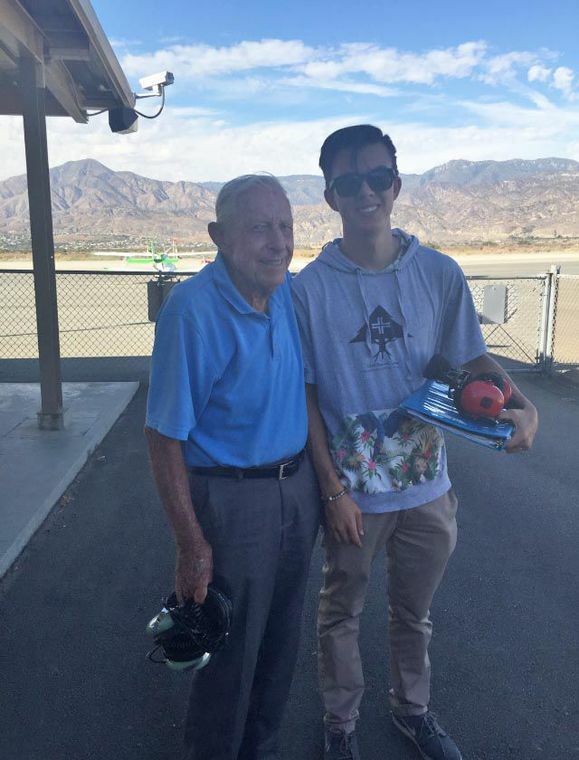 The flight instructor, age 87, held an airline transport pilot certificate with ratings for airplane single- and multi-engine land. He also held a flight instructor certificate with airplane single- and multi-engine, and instrument ratings. His most recent third-class Federal Aviation Administration (FAA) medical certificate was issued on January 9, 2017, with a limitation that he must wear corrective lenses. On the application for that certificate, he reported that he had accumulated 25,000 total hours of flight experience, of which 80 hours were in the previous 6 months. 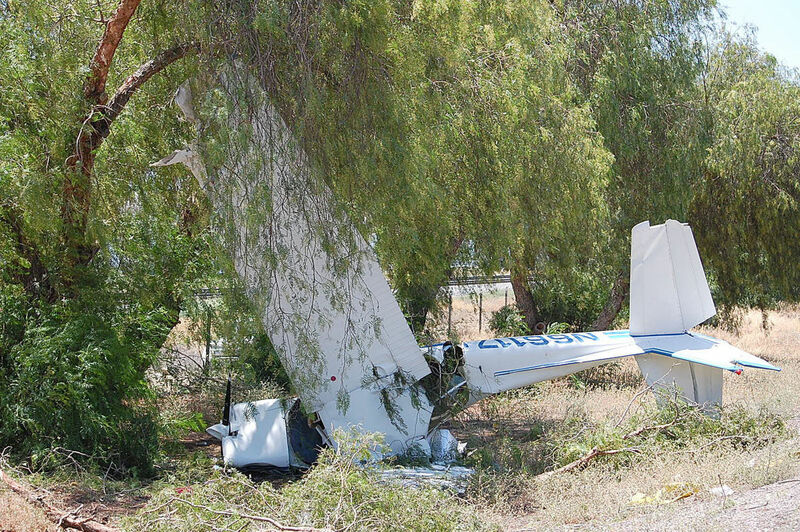 The flight instructor's logbook was not located during the investigation. 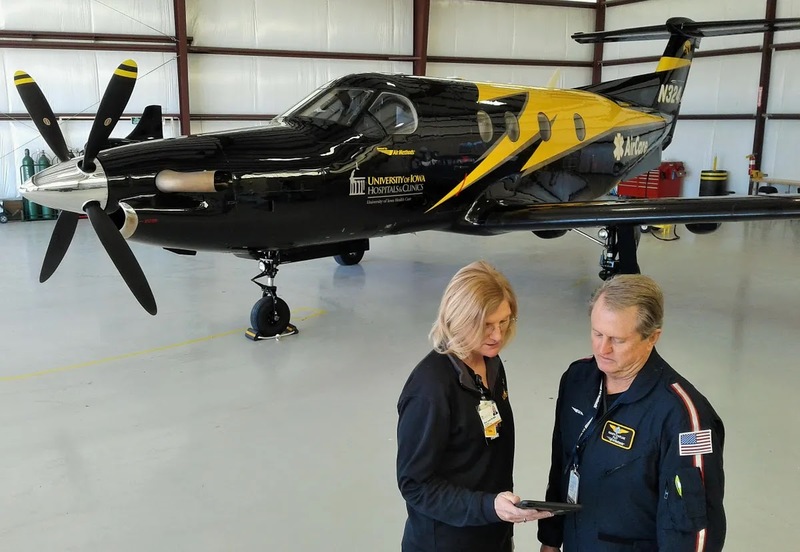 The student pilot, age 52, was working towards his private pilot certificate. His most recent FAA medical certificate was issued on March 13, 2017, which listed a limitation that he must have available glasses for near vision. His total flight time was not available. A review of maintenance records revealed that the airplane, serial number 15075848, had a total airframe time of 7,711.5 hours at the last annual inspection, dated January 12, 2017. The engine was a Continental Motors O-200-A, serial number 213969-71A. The engine total time recorded at the last logbook entry was 7,719.3 hours, and time since major overhaul was 1,273.2 hours. Airplane documentation revealed a total airframe time of 7,739.7 hours before the accident flight. 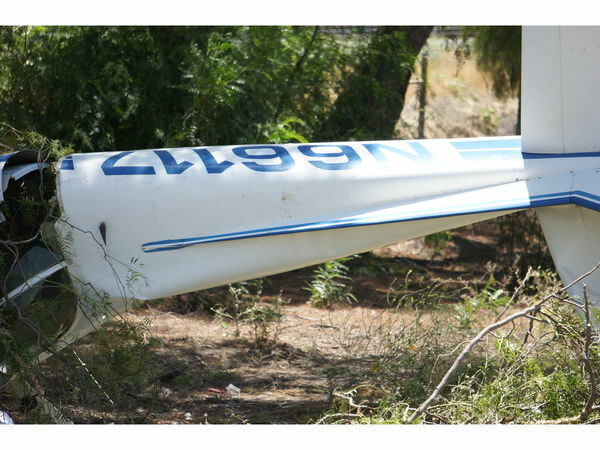 The student reported that the airplane was fueled to capacity before departure. At 1114, a remote automatic weather station at Cabazon, California, about 2 miles east of BNG, reported wind from 109° at 17 mph gusting to 23 mph. At 1114, another remote automatic weather station, Beaumont, California, about 5 miles west of BNG, reported wind from 118° at 15 mph gusting to 21 mph. At 1135, the reported weather at Big Bear City Airport, Big Bear City, California, about 20 miles north of BNG, reported, in part, wind from 050° at 8 knots gusting to 20 knots, 10 miles visibility, clear skies, temperature 19°C, dew point -1°C, and an altimeter setting of 30.18 inches of mercury. BNG had an automated weather observing system (AWOS), which was broadcasting at the time of the accident. At 1040, the AWOS recorded wind from 070° at 17 knots gusting to 22 knots. AWOS data nearer to the accident time was not obtained. Density altitude at the time of the accident was calculated to be 8,500 ft msl. BNG was at an elevation of 2,222 ft mean sea level. It was equipped with a single paved runway, designated 8/26 which measured 4,955 ft by 100 ft. Runway 26 has an uphill gradient of 2.4 percent. A left traffic pattern was recommended for runway 8, and right traffic pattern was recommended for runway 26. BNG was not equipped with an air traffic control tower. 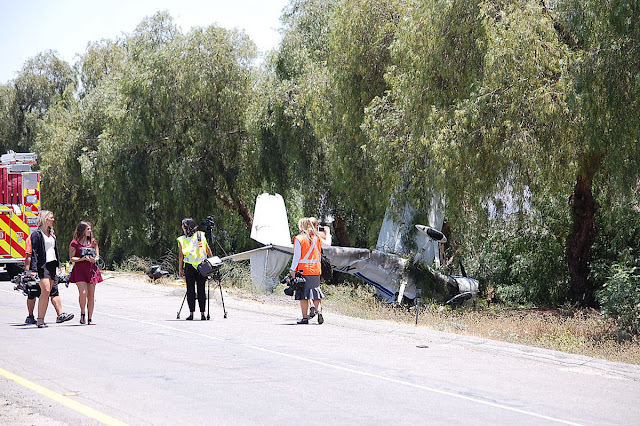 The initial examination of the accident site by an FAA inspector revealed that the airplane came to rest between a row of trees and the eastbound freeway onramp. The airplane was positioned on its left side and the left wing was partially attached. Both wings and the left horizonal stabilizer had leading edge damage. The fuselage was distorted, and the aft fuselage was partially separated near the cabin area. Impact damage was noted to one of the propeller blades; the opposing blade was unremarkable. 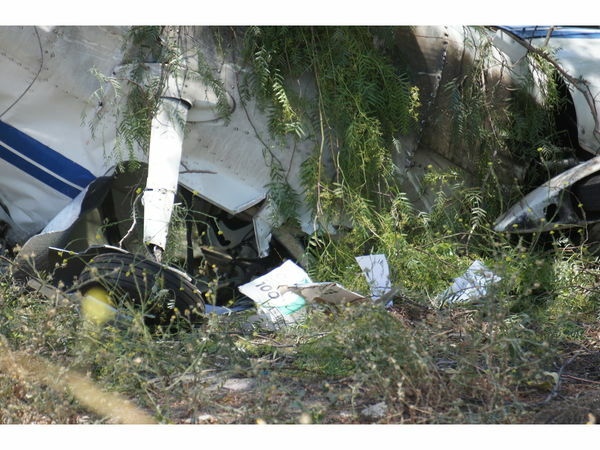 Examination of the recovered wreckage was conducted by the NTSB IIC, an FAA inspector, and investigators from Textron Aviation and Continental Motors Group. The examination revealed no evidence of any preimpact mechanical malfunctions or failures that would have precluded normal operation. For further information see the Wreckage Examination Summary in the public docket for this accident. The flight instructor was hospitalized for 4 days before he succumbed to his injuries. 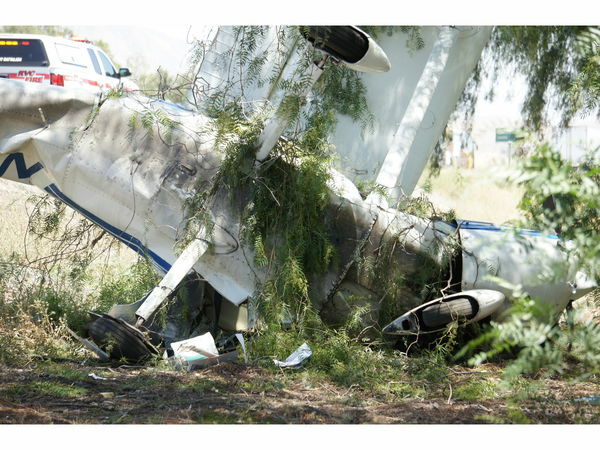 The Riverside County Sheriff-Coroner Division, Riverside County, California, conducted an autopsy on the pilot. The forensic pathologist determined that the cause of death was blunt impact injuries to the head. Toxicology samples tested negative for alcohol and no drugs were detected from a comprehensive blood panel. The airplane's takeoff distance was calculated using a performance chart from the airplane's Owner's Manual. According to the chart, at the airplane's maximum gross weight of 1,600 lbs, temperature of 0°C, at a pressure altitude of 7,500 ft msl, with no head wind, the airplane required a ground roll distance of 1,360 ft, and 2,440 to clear a 50 ft obstacle. Landing distance with no wind would have a ground roll distance of 520 ft. According to the chart, the airplane's maximum rate of climb at a pressure altitude of 5,000 ft, and a temperature of 5°C, would have been about 470 ft per minute (fpm). At a pressure altitude of 10,000 ft, and a temperature of minus 5°C, the airplane's rate of climb would have been about 260 fpm. Whether due to high altitude, high temperature, or both, reduced air density (reported in terms of density altitude) adversely affects aerodynamic performance and decreases the engine's horsepower output. Takeoff distance, power available (in normally aspirated engines), and climb rate are all adversely affected. At power settings of less than 75 percent, or at density altitude above 5,000 feet, it is also essential to lean normally-aspirated engines for maximum power on takeoff (unless the aircraft is equipped with an automatic altitude mixture control). Otherwise, the excessively rich mixture is another detriment to overall performance. According to the FAA Airplane Flying Handbook (FAA-H-8083-3B), "under conditions of high-density altitude, the airplane may be able to become airborne at an insufficient airspeed, but unable to climb out of ground effect. Consequently, the airplane may not be able to clear obstructions." The FAA Pilot's Operating Handbook (FAA-H-8083-25A) states that, due to the reduced drag in ground effect, the aircraft may seem capable of takeoff well below the recommended speed. As the aircraft rises out of ground effect with a deficiency of speed, the greater induced drag may result in marginal initial climb performance. In extreme conditions, such as…high density altitude…a deficiency of airspeed during takeoff may permit the aircraft to become airborne but be incapable of sustaining flight out of ground effect. Looks like they departed downwind into gusty air behind them. 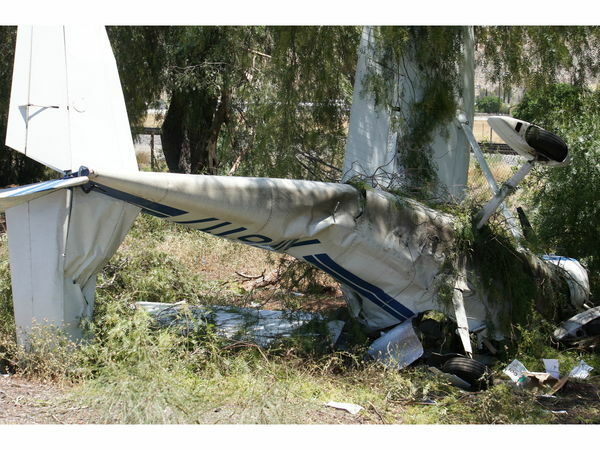 Loss of airspeed with a small engine.